Gold and silver exchange leading roles in the market quite often, especially on the short-term charts. Last time I wrote about it silver saved gold from collapse at the start of this month. The white metal unexpectedly bounced off the earlier low reversing the drop of the yellow metal. 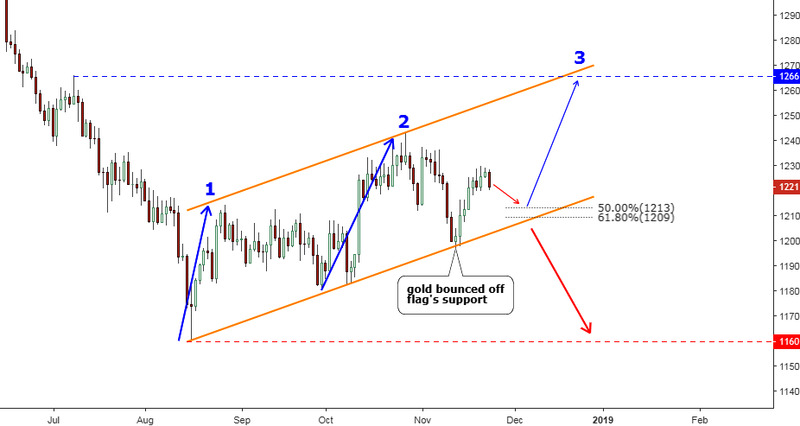 This time gold took the lead as its failure to break below the Bear Flag let silver lick its wounds and return above the $14 handle. Both metals are still trapped in the middle of the range set by the earlier heavy drop, which first occurred in gold and then it was repeated in the silver market. In this post, I have focused on the local structure as the bigger picture remains unchanged. The top metal couldn’t break below the trendline support of a Bear Flag (orange) and then quickly restored most of its losses coming back above $1200. It is interesting that the forecasted drop unfolded quite differently in each metal. Silver tagged the earlier trough, but gold failed even to breach the vertically sloped trendline. It looks like strong demand appeared right at the round number of the gold price in the $1200 area. This move up could build another leg of a prolonged correction, which is labeled as third 3rd (blue line) on the chart. The target for this leg is located on the upside of the trend channel ($1260-$1270), and it perfectly matches with the earlier top established this July. It is worth to mention that the triple-legged corrections are not as regular as simple AB/CD double leg moves. Currently, gold shows signs of a minor correction, therefore, I put the Fibonacci retracement levels to highlight the area where the last move up within the 3rd leg up could emerge. This area is located between $1209 and $1213, and it coincides with the trendline support contact point. The break below $1190 is needed to invalidate the current growth structure. Silver has a lot of tricks on the chart, and from the very beginning of this horizontal consolidation, I was puzzled to break down the initial structure, although gold has been hinting clearly at the large consolidation in both metals. The main assistant of the trader is time, as more time passes, the chart the structure of the instrument becomes clearer. As gold didn’t confirm the end of the consolidation, then we should consider the continuation of it for silver as well despite that it retested the earlier low to establish the fresh one at $13.88. It looks like we got a very complex BC junction, which consists of two counter-trend moves down (small red down arrows). The complexity emerged due to the additional pro-trend (counter-trend relative to red down arrows) sub-junction (small blue up arrows), which let silver synchronize the move with gold as earlier it has been lagging. What was considered to be a second CD leg up, turned out to be a lesser degree CD leg up of a sub-junction. The complexity of the silver chart structure was caused by the unstable nature of the market demand as central banks favor gold, and only cross-market bargain hunters eliminate the excessive miscorrelation. The second leg (CD segment) up could finally retest the $15 round level to complete this large flat correction. The minor correction that started at the end of last week already hit below the 50% Fibonacci retracement level ($14.21) and could dip further to the $14 round level as gold have more room down for the same minor retracement. The drop below $13.88 would terminate this leg up. Please share your thoughts in the vote below. What do you think about current price action in precious metals? Probably the answer to your question is the silver bulls have underestimated the power of the "Federal" Reserve to keep the prices depressed by manipulation. Their best trick is to send their Principal Dealer and partner in crime, JP Morgan Chase to the futures markets to short it. They sometimes ream up with other international banksters to ensure the job is a success. The silver bulls have been predicting a major upward move for years. It has not happened. The teen range is small and there seems to be no great demand rush despite the bull touting. If, as the bulls have noted, the demand for silver far exceeds the supply, why hasn't it exploded in price. More buffalo chips from the so called experts.